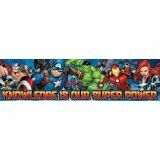 Encourage your students with Eureka Colorful Banners that inspire creativity and brilliance for any room, wall, door or bulletin board. 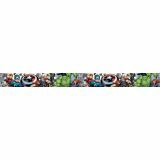 Banner measures 45" x 12". 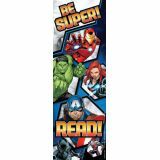 Encourage and enhance your students love for reading with colorful bookmarks. Eureka Bookmarks give you a creative way to enhance and encourage a love of reading. 36 bookmarks per package. Individual bookmark measures 2" x 6"
Go-Arounds® are a fun way to decorate around doors, windows, chalkboards, bulletin boards, archways and more. Each set features multiple characters that are designed with a flat edge on one side allowing the characters to appear as if they are peeking out of the display. 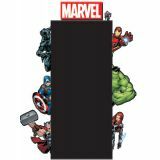 Bring out the super heroes in your classroom with a 27 piece Eureka Bulletin Board set. 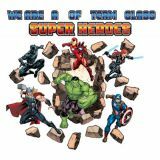 Set includes: 1 Rock Blast, 12 rock cut outs, 6 Marvel™ character cut outs, and a 7 piece We Are A Class Team of Super Heroes header. Packaged as 4 17" x 24" panels. Coordinates with the Marvel™ Super Hero Adventure collection.